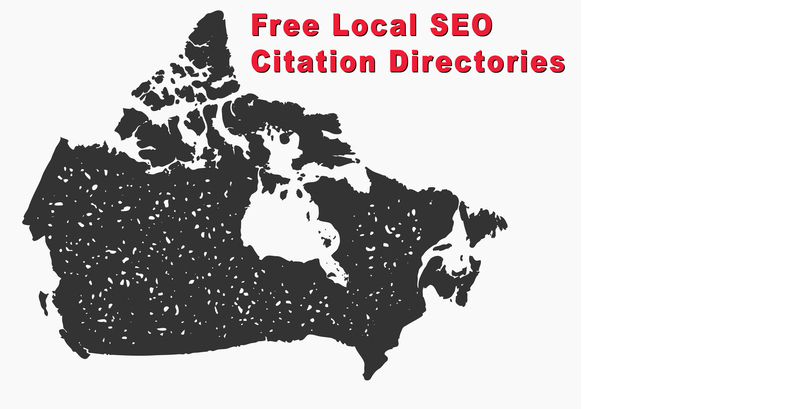 You can submit your business to the following free canadian local seo directories. www.cylex-canada.ca - Free basic entries or premium entry. www.ourbis.ca - Bilingual (English and French). canadianplanet.net - Fast inclusion and takes less than a minute to fill the form + you don't need to own a website to submit your business. profilecanada.com - Index of local businesses in Canada, very simple form. canadapages.com - You can register your own business or on behalf of your client (if you are an SEO expert or working for a digital marketing agency). HotFrog.ca - You need to click on the validation link associated with the domain name to complete your submission... if you are a SEO specialist, you need to make sure your client is aware he needs to click it (otherwise the registration will fail). Brownbook.net - Requires you to register an account first. Your listing is normally indexed by GoogleBot in less than 24h (following inclusion). Enhanced business profile with logo, photos, etc. and great NAP Consistency. theBLURB.ca - Promote your business with that 100% genuine canadian-based local seo directory. The editor approves submissions in 2 business days or less. business.yellowpages.ca - Free submission - click on Sign upper right corner and create a free listing for your store or business. local.seo.directory.411.ca - Add your canadian-based business or store (available in English and French). smallbizpages.ca/local-seo-add-your-url - Easy and fast submission, they've been around since 2005 and accept any genuine canadian-based store, company or even freelancer. More to come soon... we are updating the complete list.